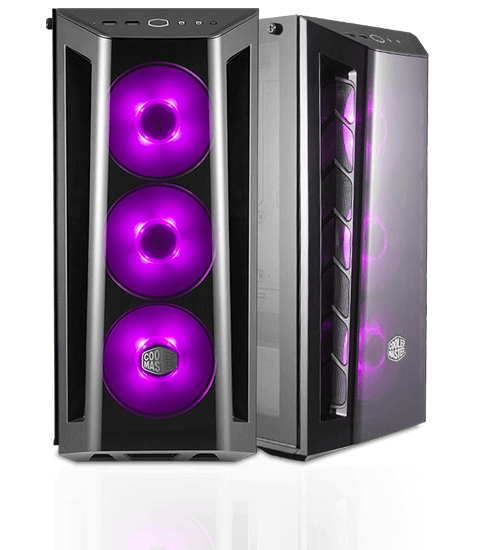 Cooler Master RGB MasterBox MB520 RGB Focuses on Lighting and showmanship with a Fully Transparent Front Panel and 3 RGB Fans. 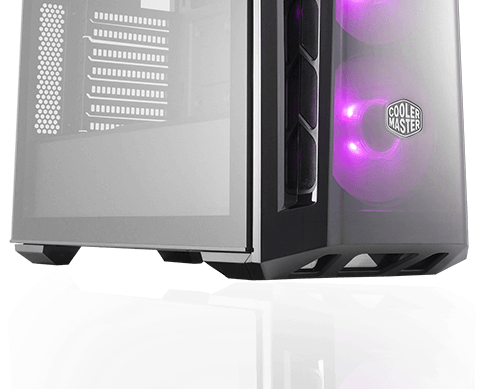 With a transparent front panel, three front RGB fans, and an edge-to-edge tempered glass panel, the MasterBox MB520 RGB is a stylish, modern case for your build.  Besides the stunning look, this mid tower case also accommodates oversized components, features bottom shroud to conceal PSU and cables, and has ample space behind motherboard tray to route and organize cables. 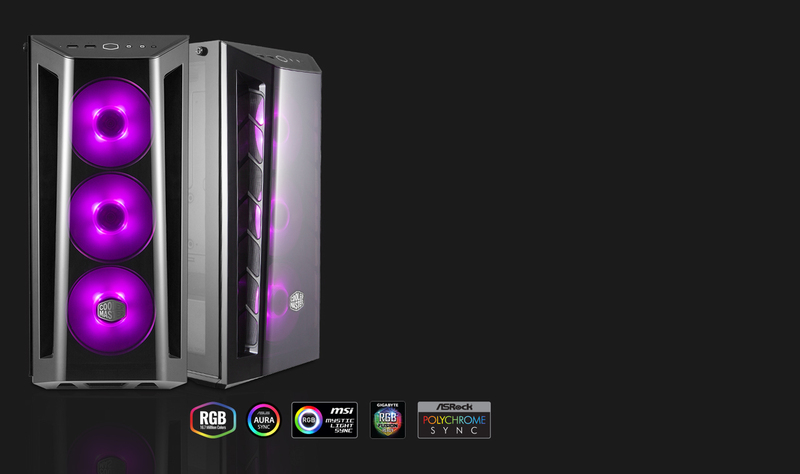 With a budget-friendly price, the MasterBox MB520 RGB is a great choice for your rigs. Shade light through a transparent, tinted front panel. Large intakes on each side of the front panel let the system breathe easy. Three 120mm RGB LED fans in front are pre-installed to create an amazing lighting effect. One RGB controller is included in the accessory pack. 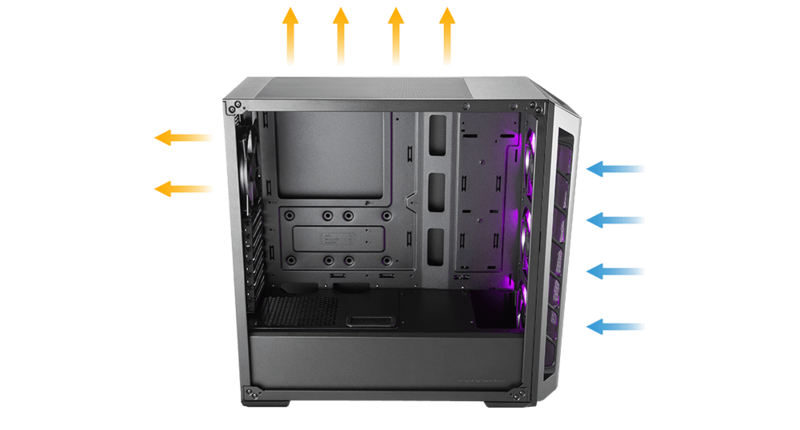 If your motherboard does not support the RGB control function, you can connect the RESET button and control the RGB lighting directly from the I/O panel. Optimized airflow due to the large intakes on each side of the front panel. Additional ventilation on the top panel adds thermal support. 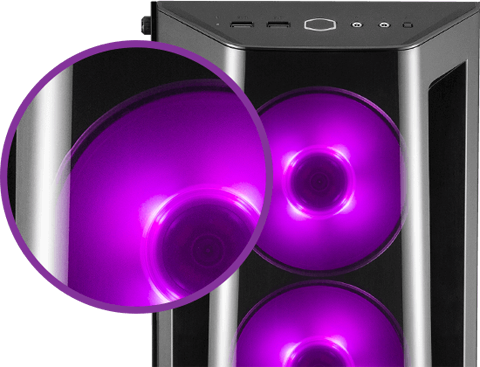 Front: Three 120mm or two 140mm fans and up to a 360mm radiator with a maximum thickness of 50mm without fans. Top: Two 120mm or two 140mm fans and supports a 120mm or a 240mm radiator. Rear: One 120mm fan or radiator. All to ensure you don’t have to compromise on performance. 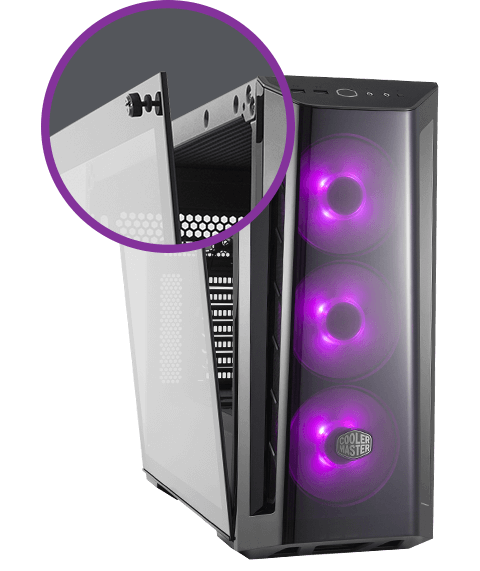 Showcase your build and system lighting effect through the 4mm-thick tempered glass side panel. The side panel bracket hinges on an angle during removal, while two "captive" screws are held in place with rubber so they are not misplaced. 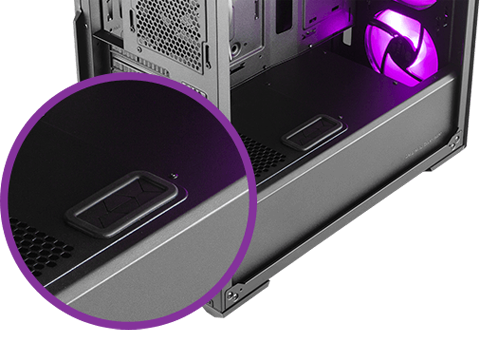 Conveniently route the graphics card cable through the PSU shroud grommet. CPU Cooler: 165mm / 6.49"
Graphics card: 410mm / 16.10"
Cable Routing: Behind MB Tray: 19-27mm / 0.74"-1.06"